I have something to implement and I am looking for the best way to do it. What I want: Using a blynk slider I will pass an int to a variable like how many seconds a relay will be on, activated. 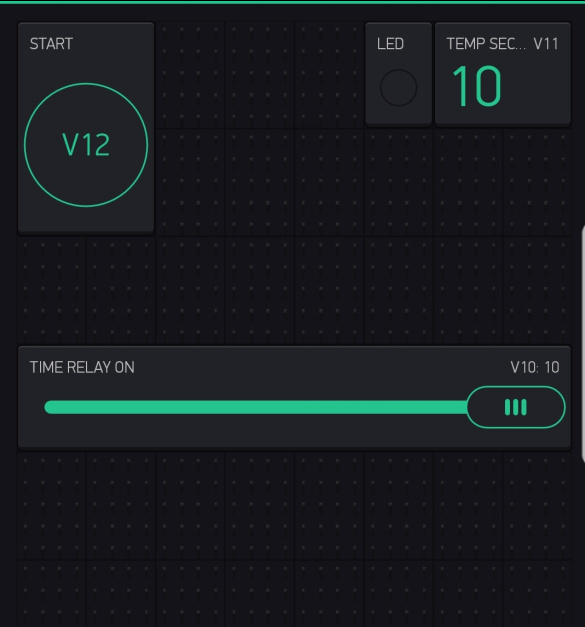 If the user press a start button then using a blynk timer ( simpletimer ) will be activated this relay on for the specified time and then off. I am in trouble how to setup and call the timer. Hello, you can sent me PM here. OK I remember now… I will visit your site. Any idea or help regarding my question? I even have a slightly more complicated example using a slider to adjust a timer for a variable speed servo… but same initial concept. First of all I would like to thank you guys for the ideas and the guidance. I can implemented now, the code part, is not so hard to me, the only concerning that is left: how to have possible using a value display widget, the countdown indication in order to have visualized the starting time in seconds down to zero when the time expired… ? Anyway I got the idea!